By Kamala, Natalie, Wendy, Joel, Jules, Lizzy, Sarabeth, Thila, Natily, Rebecca and EME team. URGENT! IMMEDIATE ACTION NEEDED TODAY! The only state where the Equal Rights Amendment has been introduced where the legislature is still in session and could vote is North Carolina. In fact, they will be in session for at least two more weeks. 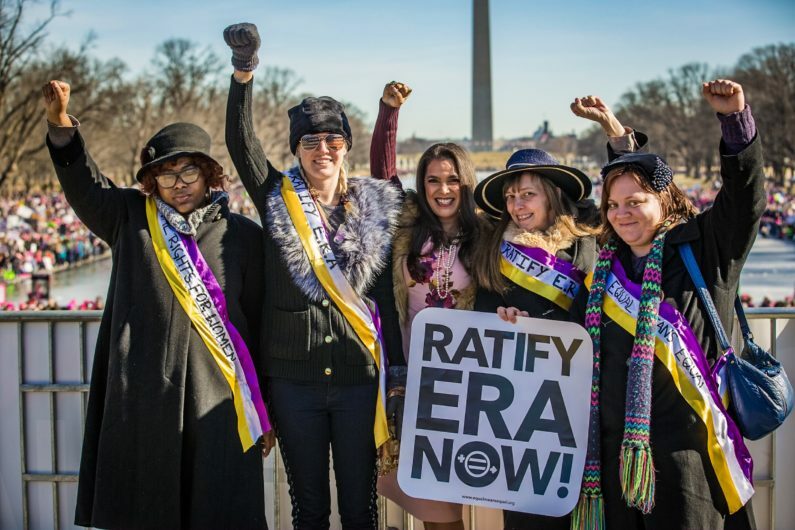 According to Roberta Madden and Marena Groll of ERA North Carolina Alliance, efforts have been underway in their state to ratify the ERA this year, with bills S85 and H102 introduced in the 2017-18 session. On May 31st, related bills were introduced in both the North Carolina House and Senate. Senators Floyd McKissick and Terry Van Duyn are the primary sponsors of S782, which explains why the ERA is still viable for ratification today and allocates $10,000 to educate the public about the act. In the House, Representatives Carla Cunningham, Susan Fisher, Evelyn Terry and Deb Butler are primary sponsors of the companion bill H1072. We need to turn up the heat and get commitments from legislators to vote “yes” on ERA in the next session. But we need to get these commitments NOW, before the November elections so women can vote for candidates who will vote yes when ERA comes up for a vote in the 2019 session. Equality warriors, there is NO TIME TO WASTE. We must be able to hold these officials to account come election day! We need you to start calling legislators TODAY. Tell them you support equality for all Americans and ask them if they support the ERA. If they say they do, ask them to PUT THEIR COMMITMENT IN WRITING by signing our pledge. Please call these legislators right away, email them the pledge and ask them when you can expect to get it back… signed. Let’s not let this important opportunity pass us by. We must hold these elected officially accountable by letting them know that WOMEN ARE WATCHING CAREFULLY AND WE ARE MOBILIZING POLITICALLY TO ENSURE PASSAGE OF THE ERA. Kamala, Natalie, Wendy, Joel, Jules, Lizzy, Sarabeth, Thila, Natily, Rebecca and EME team.